Nothing suitable in promotional solar powered products? How about custom branded eco friendly seed packets, logo printed corporate power banks and chargers or one of our promotional travel adaptors? Solar operated tools are a great way to promote your Green Eco publicity campaign, Use our solar chargers for your corporate promotion to encourage reduced use of electricity or simpler a leaner way to consume. new Solar chargers are ideal as solar chargers for your laptop, phone or iPod and make an appreciated executive gift to your corporate customers. 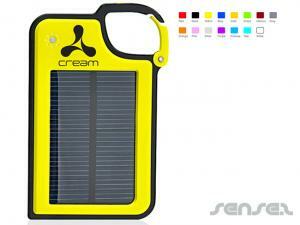 Solar chargers also work great as sales incentives or in in store promotions. 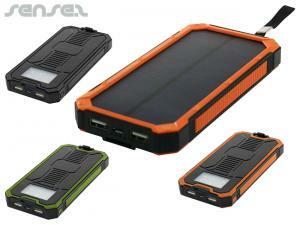 Most people still don't have a solar charger, yet everybody would like to use theirs if they had it. Solar chargers are ideal for the car, or for sales reps, who need to ensure their phone and laptops are always fully charged. For corporate innovative promotional campaigns use one of our new solar powered calculators or Promotional USB Sticks that have your blinking company logo powered by solar! Solar powered torches are ideal for adventure related promotions or for travel and the outdoors. Custom print any of our promotional solar powered tools and portray a Green Eco image to your clients.